User Agile Development: Are context-aware systems finally here? Are context-aware systems finally here? A few weeks ago, I received the recommendation from Roberto Serrano about the book "The Age of Context", I was very interested in the concept and to be honest the content of the book has not disappointed me. 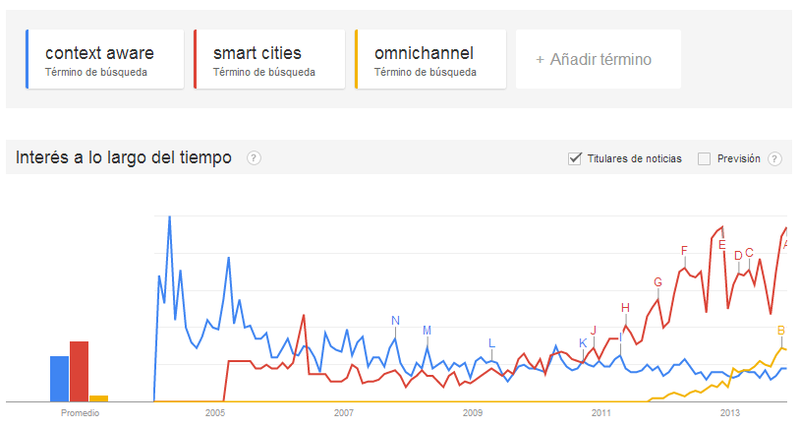 Is not a new concept, nothing further of the reality, if we analize the google trends history of context-aware we could see, the same with smart cities, they were widely used concepts in the past decade. I've also included a more contemporary concept as omnichannel. The book talks about five technologies allow us TODAY to create context aware systems, like Google Now etc. but before start talking about technology, let me make an introduction about philosophy. Emotional - How are you? How do you feel? Are you angry, happy, sad? Cognitive - How do you arrived here? Which is your background? Your expertise, your experience? Situation or Physical - Where are you? What are you doing? What are you plan to do next? There are a lot of excellent presentation of Thomas Wendts here. I reviewed some week ago one of my favorite TED Talks, from Simon Sinek about the power of why, and in my personal opinion that's the main principal missing thing of "The Age of Context" book and also the reason because I considerate Thomas Wendt's point of view the key, because is the why of the history. Social Media. Based on the last statistics only facebook has 1.8B of MAU (Monthly Active Users) from the 7B people in the world. There is a huge number of people sharing information through social media, sharing content that could be managed to identify their feelings, their emotions. Big Data. We're generating huge quantity of information every second, and is complex to process in order to generate knowledge. The big data term is applied to this new tools designed to allow us to process that complexity instead of the tools and database management traditional products. Well, that's why I thought that Thomas Wendt point of view is so important, because if we evaluate this five technology, or maybe with the glasses, or smartwatches ... we're giving focus on the WHAT, and not on the WHY. The mobile is, in my opinion, the key on the equation, is the big bang of the future, and this scenario give us the answer for example, why facebook is trying to buy blackberry, or any other mobile platform? Because the information you could get from the mobile about the user (the information we're providing to Apple, Google, Amazon (Kindle) and so force has an incredible value) is the key for the future and it supose one of the biggest threats or opportunities for Facebook. That's also why the brands need a clear mobile strategy, because they NEED to be in our pocket. Before finalize this post, let me talk about one of the most commons mistakes of the companies when they are designing the mobile strategy, some of us use the term "mobile myopia", and is the tendency to think on the mobile as the solution and forget that mobile is part of it. We need to give a consistent experience to our customers, because now they want to interact with us using the old channels and, of course, with the new ones, depending on the location, or the moment (living room, office, car, transports...) And that's why terms like omnichannel, responsive design and so on should be present in our mind, at least for a while. Because, like Thomas Wendt express in some of the presentations, we're just learning to walk. So yes, the context aware systems are already here, and not just around the corner, they were here some time ago, waiting the right moment, when the early majority is ready to understand and welcome to the big brothers systems!